Thanks to Tina from Fueled By Clouds and Coffee (and frequent Well-Appointed Desk contributor) for trading me this book! She wanted a Clear Sky and offered this. I jumped at it, having never used a Paper-Oh book before. Paper-Oh has a weird way of doing business. Try finding one of their books online for purchase. Go ahead, I'll wait. Maybe you went to their site, realized they don't sell online, the went to their store finder. If you couldn't find a nearby store, maybe you clicked on the link they gave you saying "this retailer ships to your area". And then you visited said retailer's site, only to find it out of business or no longer carrying Paper-Oh products. Maybe you tried for about 15 minutes before giving up. Or maybe that's just what happened to me. When I reached out to ask why it was such a struggle, they understood my pain. They're currently working on a North American distributor for the full line and selling online themselves, and they're in the middle of that process. No timeline was given, but once something happens, I'll be sure to update this post. The book I'm looking at today is the Quadro, B6-size. 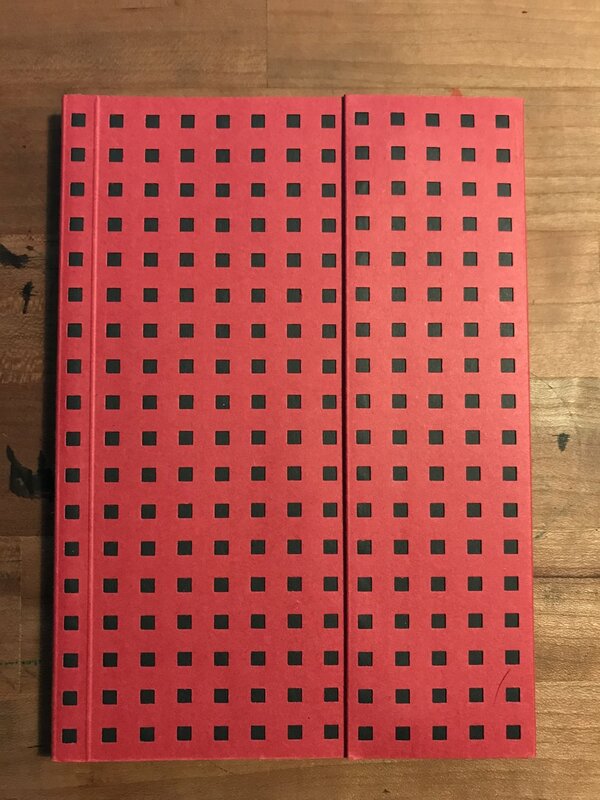 The covers of these books are duplexed with heavy stock on top with squares die-cut out so you can see the accent color underneath. Mine is black and red. It has a flap with two magnets near the top and bottom of the book that hold the flap, and the book, shut. While the magnets aren't strong, they do hold well and are pretty neat. Hey, your barn door is open. The designs of most of their books on the site are really cool, and very different than what others are doing. While everyone seems to be making a notebook for the masses, trying to make the "last notebook you'll ever need", Paper-Oh throws caution to the wind and seems to have a good time doing it. They know you're going to have a lot of notebooks, and sometimes you want something fun. You can tell the designers over there are having a good time and just playing...with color, with texture, with binding. Check out this video of the process. The book is designed to lay flat, and does a good job. It is Smythe stitch bound. There are seven signatures with 16 pages a piece for a total of 112 pages. The paper is 100% sustainable, unbleached, uncoated paper from China. According to Paper-Oh, the paper in the Quadro is 100gsm, and their cahiers are all 80gsm. It's pressed twice to make it extra smooth. But it's still got a little texture to it and is really good for graphite. Unfortunately, however, it's atrocious with fountain pen. As you can see in my pictures, even my fine-nib Pilot Metropolitan bled through the page. Forget using a medium nib. You MIGHT be able to get a combination of extra fine nib and dry ink that may work, but you'll still get feathering. The feathering is bad. On gel and rollerballs, a wet roller may bleed, but the feathering isn't there. Most of the gel pens I used faired pretty well. Because of this, I don't know who their target audience is. Pencil people? Overall, for my particular purposes, the book is just fine. I like the cover and how it folds over and clasps shut with magnets. I like the included self-attachable bookmark. It's a neat touch. 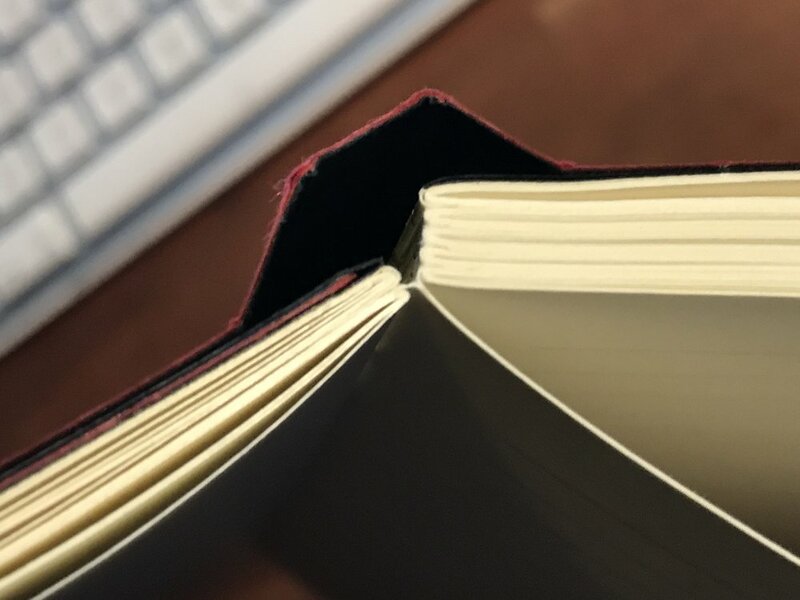 The paper is just fine for writing and journaling in pencil, which is my plan for this book, but on the odd days that I want to journal in fountain pen, whether I'm testing something or just get the itch, I won't be able to scratch it in this book. Depending on what your plans are for the Paper-Oh Quadro, I can recommend it for the cool design and graphite-friendly paper. However, I can't recommend it for fountain pen users at all. You will be disappointed in the performance. Available at retail only, for now. MSRP $10.95. Check the store locator for local merchants.